SIX people have died in a horror 24 hours on NSW roads. Another man in Queensland has also died. Three of those were killed after a fiery head-on collision near Canberra overnight. 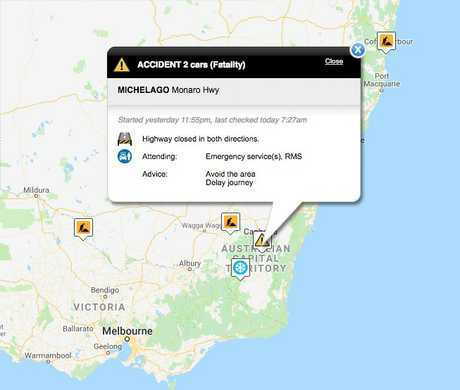 Just before 11.30pm last night emergency services were called to the Monaro Highway at Michelago, about 38km south of Queanbeyan, following reports two vehicles had collided head-on. As a result of the crash, one of the vehicles caught fire. The driver and passenger of one vehicle died at the scene. The driver of the second vehicle also died at the scene. Paramedics took a child to Canberra Hospital. Emergency services remain at the scene of a crash on the Monaro Highway at Michelago. The highway is closed in both directions and motorists are urged to avoid the area. Please monitor https://t.co/t5HOqMnfIJ for updates on diversions. The ages of those involved are unknown at this stage. Officers from Monaro Police District established a crime scene and are investigating the circumstances surrounding the crash. The Monaro Highway was closed in both directions and is likely to remain closed for a number of hours. Fairfax reported that the collision involved a Ford Falcon sedan and a Citroen sedan. An 11-year-old boy who was travelling in the Citroen was the only survivor. NSW police are expected to detail their concerns about the road toll at midday media briefing. It comes after a motorcycle rider died after being found unconscious near a crash scene in Queensland overnight. Motorists are urged to avoid the area and check www.livetraffic.com for the latest information.